Titans of thrash metal Slayer have announced their plans to disband after 37 years as one of the biggest metal bands of all time! 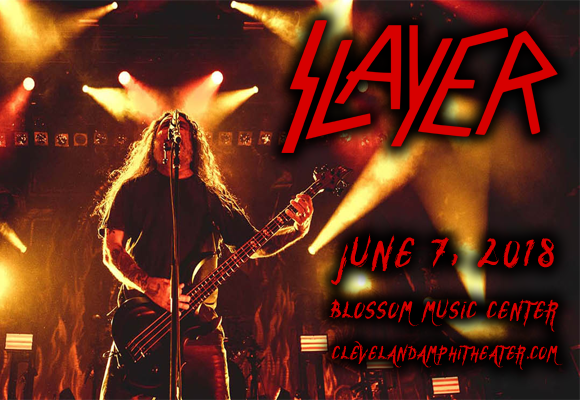 Coming to Blossom Music Center on Thursday 7th June 2018, the conics band will be performing songs from their controversial and celebrated career, and will be joined for an incredible show by fellow metal warriors Anthrax., Behemoth and Testament! A pioneering force behind heavy metal music, Slayer was formed in 1981 by guitarists Kerry King and Jeff Hanneman and has become known as one of the “big four” founding bands of thrash metal alongside Metallica, Megadeth and Anthrax. With controversial lyrics and album art, as well as a sound that was heavier than anything that had come before, Slayer have been as provocative as they have been influential over the years. Reign in Blood (1986), the band's third studio album, has been described as “one of the heaviest and most influential thrash metal albums.” To date, Slayer has released twelve studio albums (four have been certified gold by the RIAA), two live albums, a box set, six music videos, two extended plays and a cover album, and they have received five Grammy Award nominations. The band embark on their farewell this summer, after 37 years of recording and touring.